Dear Readers… I had a heck of a night last night – in a good way. Mr. Muse and I went to a friends house to celebrate the return of our friend, Trevor, from his tour in the Middle East. I’m going to say that between eight of us, we finished off a gallon of homemade wine in two hours. We finished off six more bottles of wine and a bottle port by the end of the “evening”. We had a great time and when Mr. Muse and I went to go home I saw the clock in the car and it was 2 AM! Time had flown by and I thought it was only 10 PM. Apparently everyone had the same reaction, that it was much much later (or early) than we all thought. We all had a really great evening which may or may not have been interrupted by some traveling through a worm hole, advancing time. Or we all blacked out at the same time. That was some good homemade wine. So yeah. I had a hangover this morning. Not proud of that, but the hosts of last night’s shindig stopped at the house today to borrow Mr. Muse’s wood shop, and they commented that they had the same issue I did: they drink whatever is in the glass before them, and in our group, the glasses seem to fill themselves magically. I’m glad I’m not the only one. I also need to put a large glass of water in front of myself at these events. 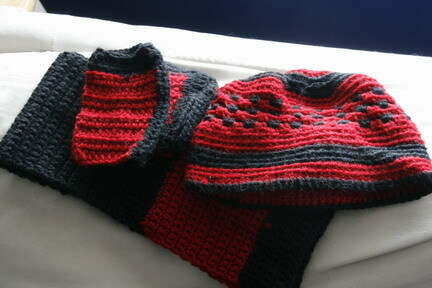 Surprise for a friend: Hat, scarf and hand warmers. I’ve had a slow week. I cooked, I baked, I read books and watched some TV. I finished up one baby blanket and getting that boxed up and wrapped and staring at the leftover yarn, decided that I needed to start on another one. People seem to keep procreating for some reason, so I might as well just work ahead. I also made a pass through my yarn stash, finding some skeins I’d forgotten about, however, I had the presence of mind to store those skeins with the project patterns I bought the yard for in the first place. Sometimes I’m so smart! Alex, inspecting the finished baby blanket to be sure it’s up to par. I also looked at the current baby blanket I decided to crochet, and reviewing what I had left for the yarn I was using, I knew I was growing to run out of a couple colors. I decided to plan out the colors of the squares and prepared my list of colors that I needed from the fabric store. Mr. Muse needed to stop there as well for some paintbrushes for his model train layout, and I hit the yarn aisle, my mental list at the fore and snapped up the three skeins I needed… and seven others. I couldn’t stop myself (like the wine last night), and Mr. Muse laughingly asked if all of those skeins were on my list. Thankfully he laughed and shook his head when I responded, “No, but I need options and people keep making babies for some reason. What’s a few more skeins of yarn?” He’s a pretty understanding guy. I think I’ll keep him. This week also had me pondering a conversation I’d had with DazyLady about careers and passion. She’d asked me if I was going to look for a new job since I’m presently laid off. Since I’m still employed, it’s just that things are so slow the owners don’t have anything for me to do but will when things pick up, I’m not jonesing to go looking for another job. Besides, my employers are incredibly flexible – if I need a day off or I have a vacation – I just let them know, and I can do my thing. It’s a pretty sweet deal. DazyLady knows her “calling” and she really has a passion for it (I’m leaving it up to her to reveal or not, her calling). She asked me what I was passionate about, something I’ve been asked before, and a question for which I have never felt that I have had a good, or even “right”, answer. So I answered her the only way I knew how, “Nothing.” She found it hard to believe. Was there nothing that I was passionate about? Nope. I explained that there are things I enjoy, sometimes I really enjoy them, but there is nothing that I can think of where I wake up in the morning, excited that I get to do it for a living or a hobby. Folks, I’m pretty “even keeled”. I posed the passion question to our friends last night, and only two responded that they had passions. One friend’s passion was to design and build a hydrogen-fueled car but the government has road-blocks in place, so for him, that passion is a pipe dream. Another friend loves his job, he really likes to go into work, he stays up nights pondering issues that came up during the day, he even works weekends often because he enjoys solving the problems he encounters. So folks, am I even more weird than I first thought? Is my feeling that I don’t have a passion for anything odd? Am I thinking of “passion” in too narrow of a scope or is it truly something that grips you tightly and won’t let you go? Is “passion” merely something that you can’t imagine not doing… like breathing? If that is the case, I’m pretty passionate about breathing. And well, there you have it… this week was a normal week, with overindulging in wine and yarn and a huge pondering. I can’t seem to let go of this “passion” stuff right now, so I’ll be musing over it some more. Have any of you gone through this? Have you searched for and found or realized your passion? Do you have any books or websites that you’d recommend? 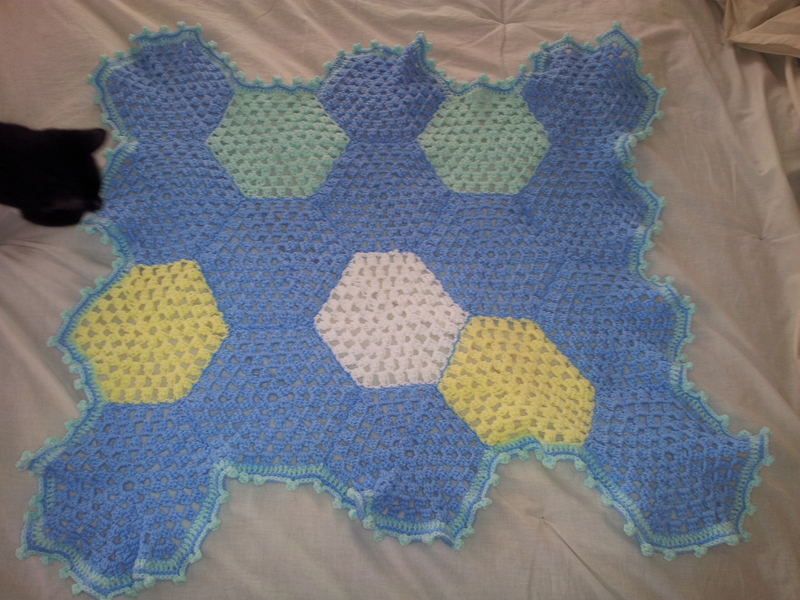 This entry was posted in Musings, Personal, Random Thoughts and tagged career passion, crocheting, DazyLady, finding your passion, this roller coaster called my life blog, what is passion. Bookmark the permalink. 5 Responses to Sunday… Afternoon. I know why I am here. Does that count as my passion? I was made to create. If I could not, then I would be hard pressed to find a good reason for visiting earth. I’m not sure, it might, however, based on your second statement – I think that makes it a passion. I can’t say I have a passion either. I’ve never been that into one thing, if that makes sense. I have a friend who was passionate about a certain music group and I can’t say I would want to limit myself to one thing. This was a very interesting question….. I love music, but would I want to find myself working in the music industry? No. This really has been a tremendous exercise in self analysis.